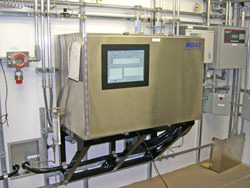 The Titan-OL is a turnkey, process-ready gas analysis system. The analyzer and sample handling hardware can be wall or frame mounted in a NEMA enclosure suitable for use in production environments, including Class I, Div. 1. The integrated sampling system is fully purgeable and can handle multiple sample and reference lines. The Titan-OL is equipped with an industrial computer system. Analyzer software includes control and alarm features which integrate with plant process software.